At the grassroots level it is very rare to have a player that has already designated themselves as a goalkeeper. It used to be a place to hide the weakest player but more and more we see coaches rotating who plays in goal each week. As such, it's important to include goalkeeper's in your session planning or at least include components of goalkeeping so that players can learn/experiment and potentially find a love for the position. The session doesn't need to be built around the player with the gloves on, but elements of goalkeeping can be included in all manner of ways. 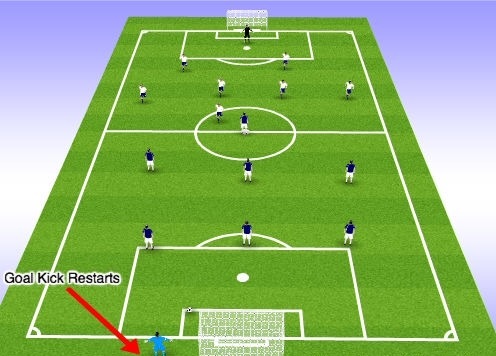 This might be having end zone players who have to catch the ball in order to score goals, 1 v. 1 games where the defenders can win the ball with their hands or perhaps using conditioned games where there are no corners (restarts come from goalkeeper's - increased distribution opportunities). Playing out of the back. Passing. Distribution. Scanning the field. Decision Making. Catching. Shot Stopping. Dealing with crosses. Movement. Sight of ball. Footwork. Motor movements. Handling. Catching. Co-ordination. Diving. 1 v. 1's. Breakaways. Closing down the attacker. Positioning. Decision making. Bravery. Distribution. Playing out of the back. Passing. Long passing. Goal kicks. Decision making. Transition. Communication. Distribution. Decision Making. Weight/angle of pass. Concentration. Focus. Transition. Counter attacking. Everything related to being a goalkeeper. Possession to penetrate. Players in the middle must stop the ball from being transferred to the other side. Play for two minutes and see which defenders/goalkeeper's concede the least. -Progression: Catch the ball three times and switch with a team of your choice on the outside. Passing lanes/penetration. 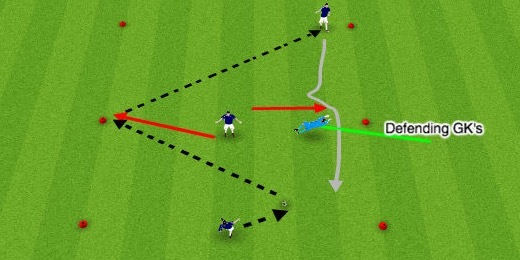 In groups of three, attackers try to score by getting the ball through the triangles. Defenders/goalkeepers can stop the ball by any means necessary. Play for two minutes and switch. -Progression: make the triangles smaller to challenge the attackers further. Goalkeeper's should be incorporated into grassroots sessions as often as possible so that player's can learn the position, have the opportunity to try it and can understand how it relates to the game. The session doesn't need to necessarily be a goalkeeper session but goalkeepers should be incorporated wherever possible. Not everyone has the luxury of a dedicated goalkeeper coach, therefore we should always be looking for ways to include this component of the game in session's ourselves.